A bare stage. A man, THE PRESIDENT OF THE UNITED STATES, stands in front of a microphone. My fellow Americans. Tonight I would like to talk to you about the rumors which have been recently swirling around the media. These rumors concern an alleged comet, which according to television pundits, fringe scientists and conspiracy theorists alike, will strike the Western Hemisphere of our planet later this week resulting in as they put it, “complete and total destruction of the world as we know it.” (Beat.) I before you today, as your elected leader, to tell you that this is simply not true. (Pause.) There is no such comet and our world is certainly not in danger of extinction. My fellow Americans, in times such as these, we must think objectively and not fall victim to figments of the human imagination. Our ability to imagine is what makes us great. Imagination is the tool of progress, the beacon of hope in times of darkness. But imagination can also be our greatest foe, persuading us to give into fears predicated on the fictions of Hollywood. Tonight I ask that you refrain from giving into fear, but instead turn to sound logic. (Beat.) Again, I repeat, there is no comet and we are under no imminent… (Pause.) I’m sorry. I can’t do this. PRESIDENT starts to walk away. He stops. He looks at the crowd. He returns to the microphone. FRANCES RACHEL ORNSTEIN (FRANNY): Mid-late 20s, pretty enough, yet slightly insecure. A sous chef. JENKS HEDGEPATH: Mid-late 20s, Franny’s fiancé. Well-built, gym-sculpted physique on a slender frame, classic good looks with a good head of hair. Knows how to pronounce words like “coif.” Venture capitalist. VERA: Mid-late 20s, Franny’s assistant, attractive, great sense of humor, buoyant, the sort of person overlooked in high school who everyone cannot get over how great she looks at a high school reunion. CHUCK (or DAVE): Mid-late 20s, rugged lumberjack physique. White ethnic. Also knows how to pronounce “coif,” but wouldn’t be caught dead saying it. Has perpetual two days’ growth of beard. Should look good in a flannel shirt. Ponytail optional. Plumber or furniture restorer. R.S. : Acerbic sense of humor. Small of physical stature but with commanding sense of self. PHELPS: WASP with a basic no-nonsense integrity. Dry sense of humor. Setting: A bedroom. Diffused morning light through window blinds shines upon a queen-sized bed that is adorned with attractive blankets, pillows, and a duvet cover. To the right of the bed on a nightstand is a digital alarm clock, its digits frozen in time. Click here to read Darkest Waters, a short play by Alan Stolzer. Alan Stolzer was born, raised and educated in New York City. After completion of military service, he traveled throughout Western Europe working odd jobs while writing freelance journalism for International Herald Tribune, Mallorca Daily Bulletin and various other European dailies (translated articles). Alan has been published in El Sol de Mexico and El Heraldo de Mexico. He continued writing upon return to U.S. and have written for the stage since. He studied with playwright John Ford Noonan, and served as dramaturg at St. Clements Theatre, New York, NY. 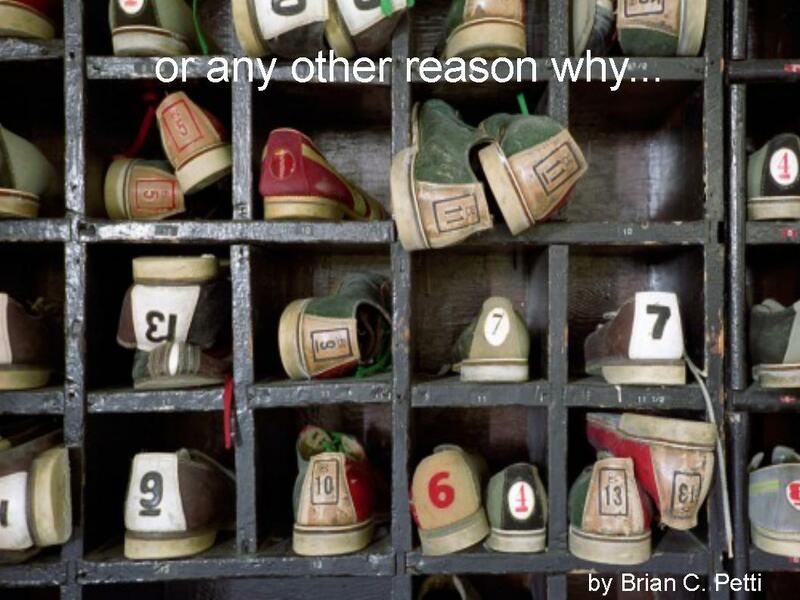 Click here to read Or Any Other Reason Why by Brian C. Petti. against cold glass, the other on the key to the door. but one never knows the weather always, do we? his name for fear he wouldn’t answer me yet again. Tim J Brennan’s one act plays have played in Bethesda MD, Bloomington IL, Rochester MN, San Diego, and other nice stages. Brennan lives in southeastern MN, a nice place to write about all kinds of stuff. Click here to read The Wake-Up Call, a ten-minute play by Roy Proctor. Roy Proctor, a native of Thomasville, N.C., has completed three full-length plays and 36 short plays since he turned to playwriting 2 ½ years ago after a 30-year career as the staff theater and art critic on the two daily newspapers in Richmond, Va. His plays have been presented in Cambridge, England; Cardiff, Wales; New York City; Washington, D.C.; Richmond; New Orleans, La. ; and points in between. Short plays from his 12-play cycle of adaptations of Chekhov short stories were presented this summer in Richmond, Raleigh, N.C., and Edinboro, Pa. He lives in Richmond and is a member of the Dramatists Guild of America.